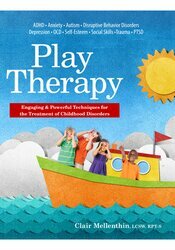 Play Therapy is filled with dozens of powerful play techniques adapted for use in individual, family, and group therapy, for schools, and at home. Clair Mellenthin, LCSW, RPT-S, focuses on providing play therapy to children, teens, and their families. Ms. Mellenthin is a sought-after supervisor in play therapy, and an adjunct faculty member at USC. She is also the author of My Many Colors of Me Workbook. Ms. Mellenthin frequently presents professional play therapy and family therapy trainings and appears on local and national TV and radio as an expert on child and family issues.